Gary Charman has left Burgess Hill Town to join Bognor Regis Town for a third time. Picture by Chris Neal. Burgess Hill Town defender Gary Charman has left the club to rejoin former club, and Bostik Premier rivals, Bognor Regis Town. Charman has returned to the Nyewood Lane-outfit for a third spell, following his release by the Hillians. The central defender has now recovered from an injury which has kept him out of the Burgess Hill team for the past month and will be in the squad for Bognor’s league match at Harlow Town. 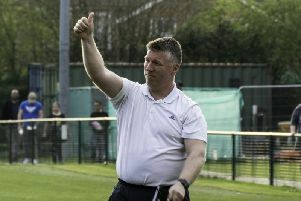 Bognor Regis Town boss Jack Pearce said: "We know all about Gary's strengths and, of course, he knows all about the club, our principles and the manner in which we like to play the game. So, in many ways it is a perfect fit.